For more information on these events click here! Breckenridge Opening Day is on the Radar! Just over 2 weeks until Breckenridge Ski Resort’s Opening Day. The countdown to November 11, 2016, is on! Breckenridge Ski Resort is scheduled to open November 11, 2016, and town is buzzing with excitement especially after Arapahoe Basin’s opening day last week! I think it is safe to say we are all getting eager about the upcoming weather change while still holding onto the last precious moments of fall. Check out the below for the day’s activities plus tips and tricks to make the best out of the first day of the ski season! It actually all starts Thursday, November 10, at 7:00 a.m. with Wake Up Breck. This year is Breckenridge’s 13th Annual Wake Up Breck. Start out your morning before opening day with a delicious cup of FREE coffee and a FREE commemorative coffee mug. Only 1500 mugs are available while supplies last so make sure you get out early. A list of participating coffee shops should be updated here very soon! Make sure to get to the resort early! The resort will kick off the ski season bright and early at 8 a.m. with live music at the base of Peak 8. Make sure to get your pass either in the mail or get to the resort nice and early to avoid the long lines of having to print your pass. The ribbon cutting ceremony and first chair will start promptly at 9 a.m. Check your gear! Don’t want to forget one mitten, one pole, or one ski! But that’s not all. Check your pockets and make sure you didn’t leave your pass in another jacket. For more information on what not to forget and how to be safe out there, check out our Opening Day blog. Get that body ready! It’s your first day out, and if you are like us, you might not have prepped as much you should have. However, make sure to get your legs warmed up the day of with some early morning stretching. And fuel that body with a good breakfast. Want to start early? Read our Shape Up for Ski Season blog to get a bit of a head start. That’s it! Come join us with donuts and coffee on Opening Day and get in those first turns of the season. Most importantly, have a little fun while you are at it. Also, remember to check the weather before you head out, you might not need those extra layers, but don’t forget the sunscreen for your face! We’ll see you soon! If you are planning a trip to Summit County to ski and ride this year make sure to visit breckenridgediscountlodging.com for the best deals on lodging! To read about what’s new in Summit County for this ski season, click here. https://www.bestofbreck.com/wp-content/uploads/2016/10/Opening-Day-Blog.jpg 1500 1500 Stefanie Van Der Kar https://www.bestofbreck.com/wp-content/uploads/2015/08/logo-332x156.png Stefanie Van Der Kar2016-10-26 20:04:202018-07-02 10:28:25Breckenridge Opening Day is on the Radar! It’s official! The 2016/17 ski season is underway! As always, each new ski season in Summit County and surrounding areas bring various improvements to the ski areas we all love to ski at and visit. This year is no exception. Although there are no major terrain expansions this season, there are some interesting new offerings. Read on to see what changes are coming to your favorite ski area. Breckenridge: Over the past 10 years Breckenridge’s pace of improvement has been frenetic to say the least. This year feels like Breckenridge is finally taking a breath and offering a few minor (but awesome) upgrades. Peak 7 joins the restaurant club: Breckenridge will be offering a new on mountain 490 seat restaurant at the top of Peak 7. The new restaurant will offer house made options like fresh made salads and a Mediterranean station. All of this will be set to the incredible views of Summit County and beyond. This restaurant will offer a great service to the skiers who like to spend most of their time on the Peak 6 and 7 side of the mountain. Improvements at the Peak 9 Base Area: Peak 9 is the place where Breckenridge Ski Area and the Town of Breckenridge actually meet, snow to town. Peak 9 is obviously a huge part of the Breckenridge experience. To make it better for all of the people who will visit Peak 9, the plaza area will see a new snow melt system and brick pavers replacing the dated cement surface, making for a more inviting and smoother transition to the snow. Keystone: Like Breckenridge, Keystone will be offering a small set of improvements but they will be fun and exciting nonetheless. New family private lessons: A family private lesson is a great way for a close group to bond together while adding skills to their bag of skiing tricks. It’s a great opportunity for skiers of all abilities to come together and get better at the snow sports they love. Private lessons can be reserved for up to six family members (or friends) of similar ability, and with instructors who specialize in working with the whole family so that everyone’s ski and snowboard needs will be met on the snow. Snowmaking improvements: Always striving to be the first Vail owned resort open (and one of the earliest in the country), More than 10 different snowmaking projects were completed to repair, upgrade and enhance Keystone’s snowmaking system, including the replacement of a primary water supply pump and upgrades to key electrical systems. Maybe not glamorous but still very important. Kidtopia – Growing like kids do: Keystone has always been a family resort offering a variety of daily programming throughout the winter season beginning Thanksgiving weekend. This year test your aim and compete with family members at the Giant Snowball Launch, hunt for the elusive sasquatch during the Bigfoot Adventure Walk, create a masterpiece and keepsake at Cupcakes and Canvases and experience the world’s largest snow fort beginning mid-December. With the majority of Kidtopia events free of charge for all participants, there is something fun for everyone. Arapahoe Basin: A-Basin is celebrating its 70th anniversary this year (Wow!) and with that the base area is undergoing $1.3 million in renovations this year. Arapahoe Sports remodel: Located at the north end of the A-Frame base lodge, the Arapahoe Sports retail shop is the only place to buy exclusive A-Basin logo wear, posters of the ski area and other gear and gifts. For years the shop has been a tiny little store, almost forgotten at the north end of the A-Frame. The final shop comes in at 2.5 times larger than the original space. A-Basin is also upgrading the A-Frame exterior to be more in line with the aesthetic of the recent base area upgrades. Base area plaza improvements: This summer A-Basin worked to finalize the look of the base area plaza, with improved walkways and ramps as well as better outdoor seating and viewing areas for the main stage. It is hoped this major regrading project will increase the enjoyment of everyone who comes to A-Basin in both winter and summer seasons. It’s coming this summer: Copper Mountain has not announced any new improvements for this ski season but they are looking towards this spring and summer to add some major new additions including a new alpine roller-coaster that will be built this coming summer, a million-dollar expansion of snowmaking and the start of an extensive network of lift-serviced mountain biking trails. Good things are coming down the pike! If you are planning a trip to Summit County to ski and ride this year that is awesome! Make sure to visit breckenridgediscountlodging.com for the best deals on lodging anywhere! It’s going to be a spooktacular weekend in Breckenridge! Check out these ghostly ways to kick off Halloween in the High Country! Make sure to reserve your stay for some wicked fun in Breckenridge this weekend! Click below for our latest special. As the last autumn leaves linger and quiet snowflakes tease us with their occasional appearances, the local mixologists in Breckenridge have you covered when it comes to crafting tasty seasonal libations. The staff at BOB has done some painstaking research to find you the best winter warmers in town at three of our favorite locations. The Blue Stag is known for more than its epic fire pit; it stirs up some amazing seasonal concoctions, too! We’ve listed our top two to get you started. Hunter S. – Named after America’s favorite vagabond, this cocktail is sure to get your mind wandering. Smokey and sweet with orange undertones, this cocktail is refreshingly smooth with a cherry kick that’s impossible to loathe. Georgia Heat – Almost as hot as the weather down south, this peachy ginger cider gives off a subtle heat from the habanero that warms your tummy while satisfying your sweet tooth. It’s hard to order just one! One of our preferred spots to hang in town, this dog friendly bar has board games galore and tons of smiling faces. And, you guessed it: this is the perfect place to enjoy après ski crafted cocktails! InCider Scoop – Served with a Granny Smith apple slice, this crisp cocktail is tart but sweet with hues of cinnamon. Be careful; your taste buds are sure to fall in love after just one dangerously delectable sip. Sundowner – The name leaves little to the imagination. After a couple of these, you might be headed in for the night. The sundowner is a delicious kick in the pants for those who enjoy a whiskey cocktail. Orange bliss meets barreled perfection. Graham Ol’ Après – Skip the chocolate cake and treat yourself to liquid dessert. This foamy concoction will take your palate on a wild ride filled with chocolate sauce and graham cracker crumbles aplenty. Ol’ Nutter Fashioned – This traditional standby gets a modern twist when flavors of orange and pecan mix with Buffalo Trace whiskey, making it an instant classic. 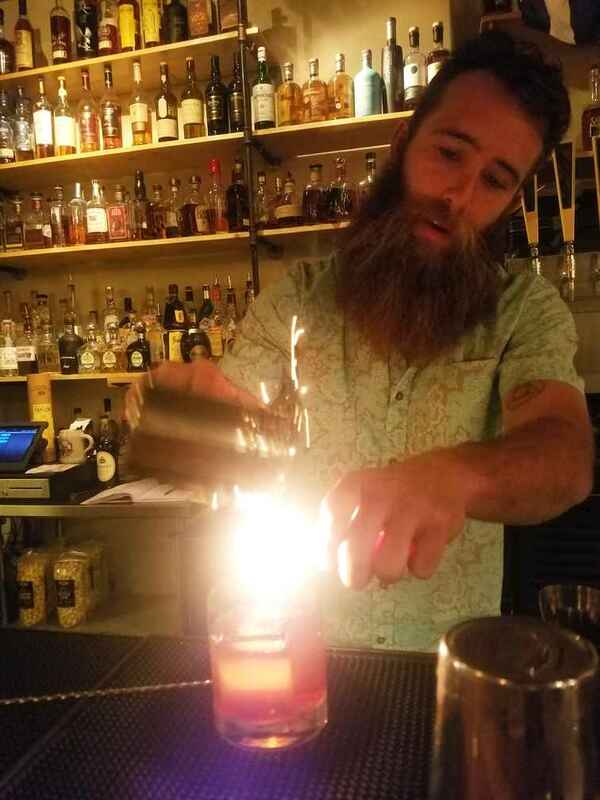 Anonymous – If you’re lucky enough to be there when mix master Justin is serving, get a mouthful of his mysteriously nameless hickory-smoked whiskey concoctions, perfected with a fired cinnamon finish. One of the go-to spots in town for martinis, try to hit the Bistro during their evening and/or late night happy hours and your wallet will be just as satisfied as your thirst. Peach & Pepper – Warm up with this tequila-based, peachy pick-me-up featuring zests of lemon with a habanero kick. Picante Fusion – Crafted with Breckenridge vodka, the surprisingly smooth fusion of pineapple with a distinct and delicious touch of basil tastefully tames the habanero bite. Pear-Ginger Mint – Get a second wind while sipping on this minty mixture that combines just the right blend of refreshing ginger, tangy lime and sweet pear. Now that we’ve got you salivating, it’s time to book your stay in Breckenridge and quench that thirst. As always, breckenridgediscountlodging.com is the prime place to find the best lodging options and prices. So, wipe that dribble off of your chin, grab your drinking shoes and come taste the spirit of the season in Breckenridge like never before. Cheers!